Below is a collection of an assortment of odd and sundry bits that have been haunting the periphery of my work area for some time, partially painted, that I’ve recently – over the last month – finished off… but didn’t feel any one group necessitated a post all of their own… or maybe they all could have, but I was feeling lazy…? Two English Civil War cavalrymen. 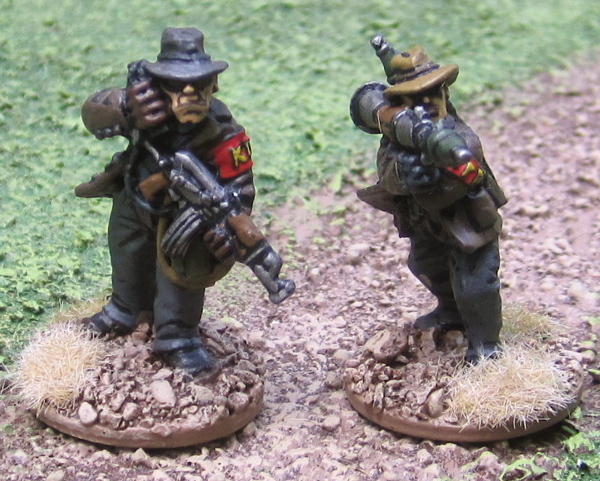 One, on the left, is from Old Glory the other, on the right, is from Perry Miniatures. 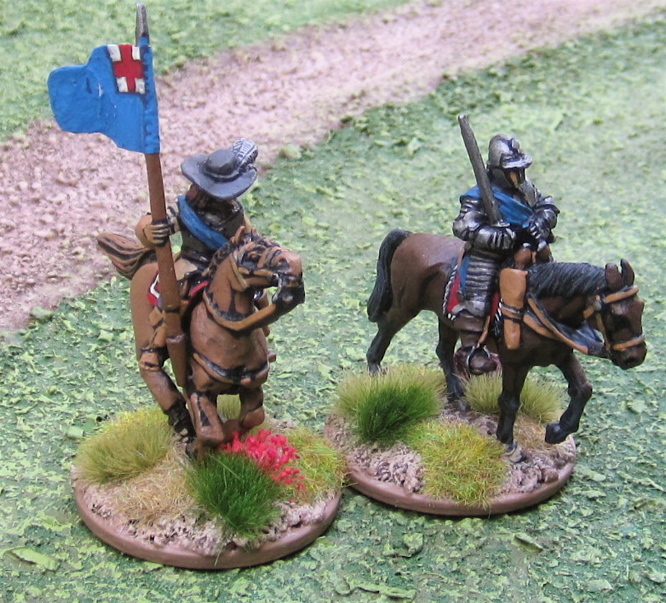 The two finish up a unit of heavy cavalry for The Pikeman’s Lament. An English Civil War musketeer casualty from Perry Miniatures. You can’t see it, because it’s hidden by the grass, but he’s sitting on his musket. 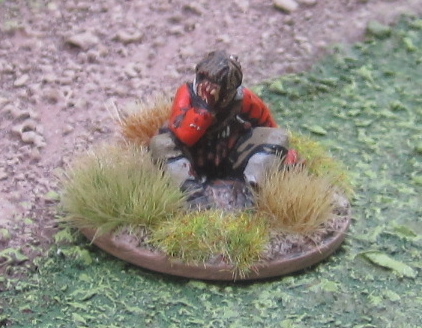 A Teutonic Knight Casualty from Gripping Beast. The beginnings of a Teutonic Knight retinue for Lion Rampant. I have two units of Mounted Men-at-Arms and an assortment of pilgrims and clergymen and a bunch of cavalry to paint up for the force. 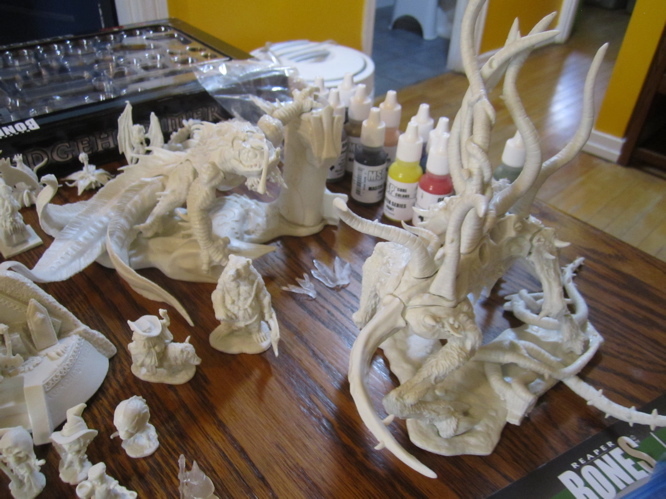 Well… some of the clergy are already painted… I’m not sure what I was thinking when I decided to pick up the knights… seemed like a good idea at the time…? I’ll probably need to pick up some Mounted Sergeants and some more foot for the force at some point… maybe when I actually get some of the other units finished!! 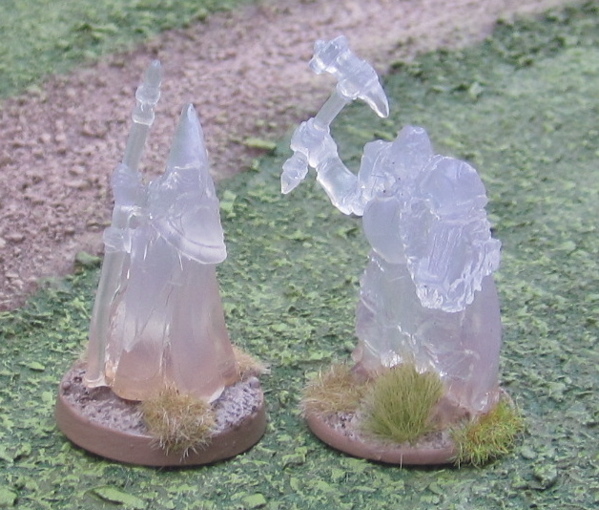 First two of the Reaper Bones 3 Kickstarter, which arrived a couple weeks ago, that I’ve “painted”. There wasn’t much painted involved – other than the base. 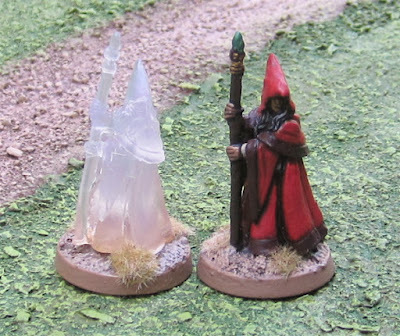 The Wizard I actually have a not-so-translucent version of – so I can make him “invisible”. I’m not sure why I ended up with the invisible/translucent dude with the hammer…? 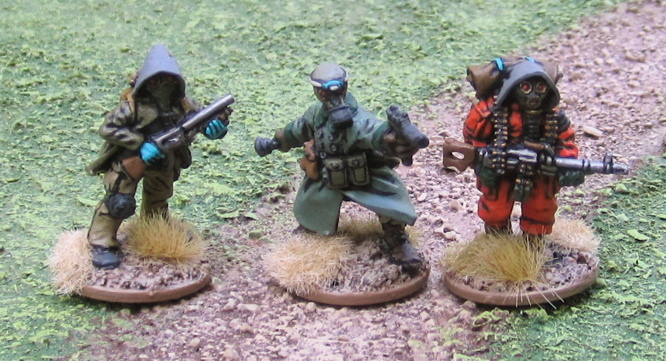 Three Lead Adventure Miniatures post-apocalyptic survivors. 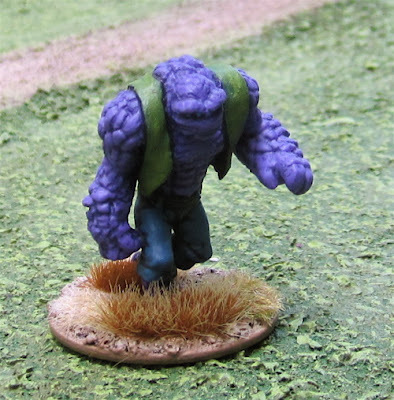 One of the figures from the Psi-Paladins and Techno-Barbarians Kickstarter for Mutants and Death Ray Guns. 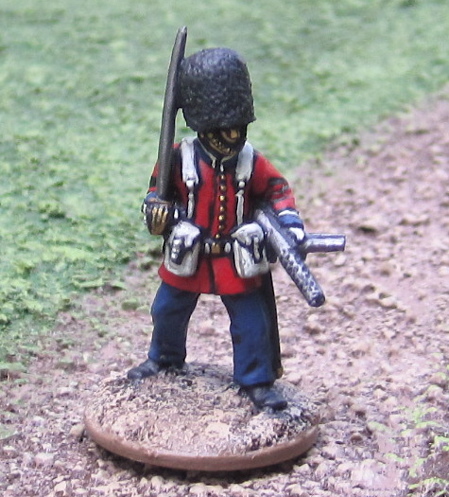 A Grenadier Guards Officer from Miniature Figurines Winter of ’79 range. 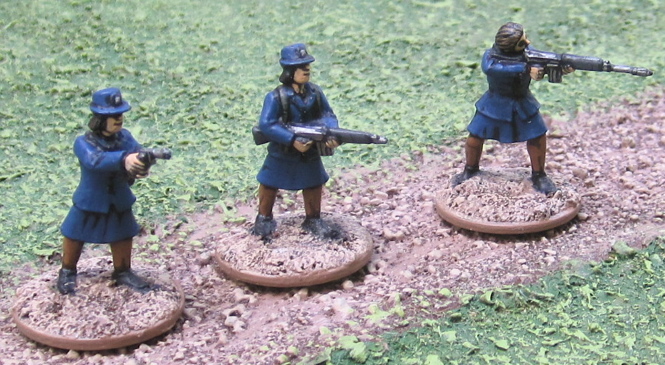 Three female police constables also from from Miniature Figurines Winter of ’79 range. With the wizard for scale – he’s pretty damned big! 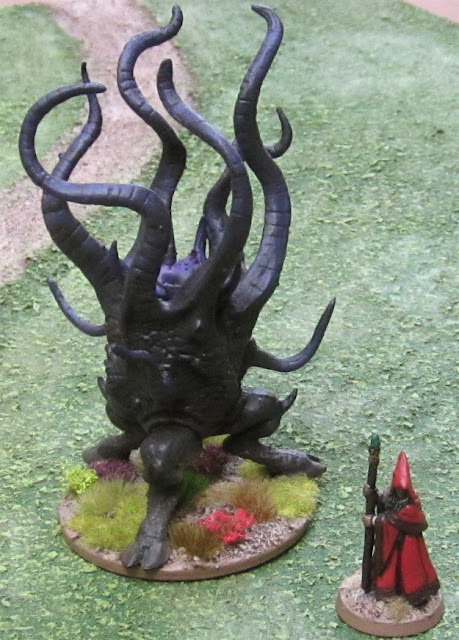 Shub0niggurath herself and Dagon are even HUGER?! Are the Grymm supposed to be like Space Dwarves…? I think so. But given that hasslefree minis are on the slightish side, I though they might fit in with one of my units of Imperial Guard Ratling snipers. Game Plan 2017: What’s Next…? 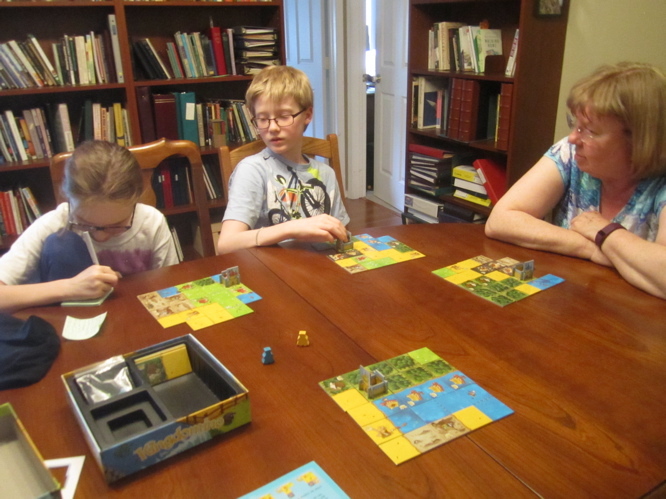 April ended with a weekend of gaming (International Tabletop Day!) and I wondered if the game playing would peter out a but due to gaming exhaustion, but it turned out to have the opposite effect – it kind of reminded us how much fun we have gamin and inspired us to get gaming MORE! Well… at least for the first week or so… Towards the end of the month we got wrapped up in kids activities that were wrapping up for the (skool) year. I have to admit I started writing this post at the beginning of May and tried adding a bit to it after each game – hoping to jot down some notes about each game AS THEY WERE PLAYED rather than trying to remember what the hell happened at the end of the month. Sometimes I remembered to do this… other times not-so-much… hence more detail about some games than others. 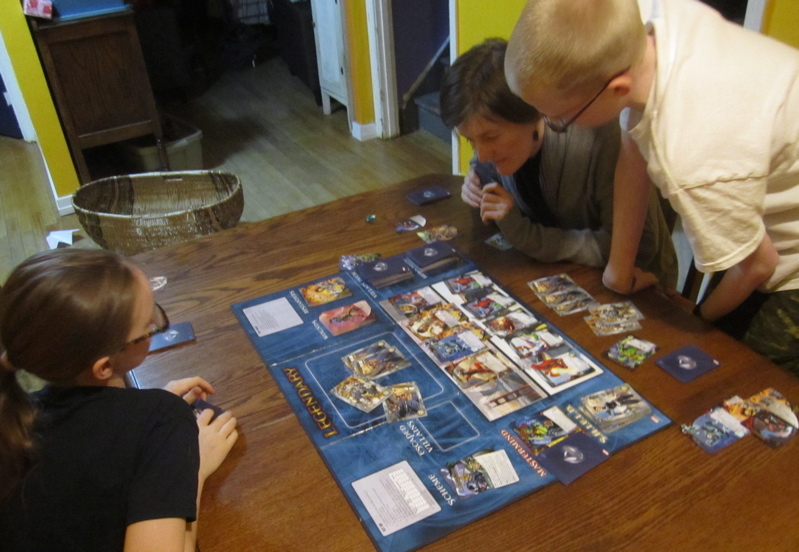 The Girl played Twonky, Finnegan played… um… I forget who he played… and I played #5 (whatever his name is…? I always thought he looked like that robot from… dang what was that movie called…? With Ally Sheedy and a robot named Number Five…? Short Circuit? 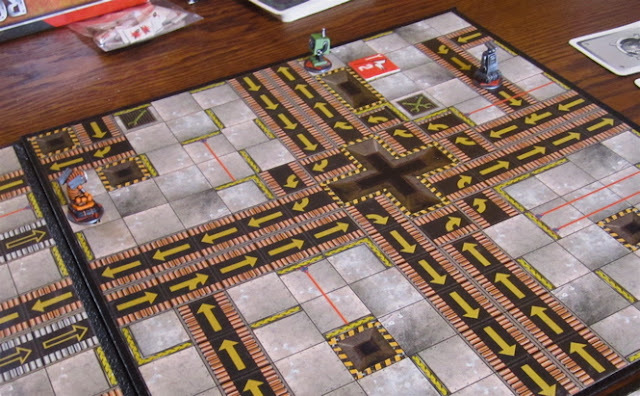 Finnegan had the worst game – he drove his robot off the board or into pits THREE TIMES!? He only ever made it to the second marker (out of four). 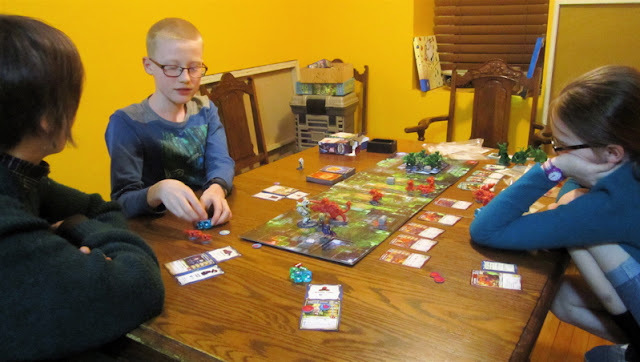 He took it all rather well and laughed the whole time – which is a HUGE improvement from previous games we’ve had when he was driven to tears of frustration! I had a pretty commanding lead for the first bit. Got to the first marker while Finnegan was still floundering on the first board. Made a clean getaway before The Girl’s robot got there. 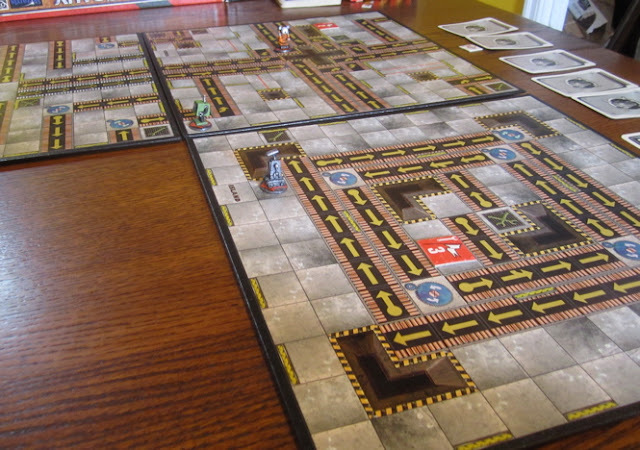 I made a mistake trying to get to the third marker and got turned around on the conveyor belts surrounding it. I still got there before The Girl, but I kind of took the long way around trying to extract myself from this mess while avoiding The Girl and her robot’s presser beam option/upgrade – which could have spelt disaster with all these conveyor belts leading into pits! Then she had a couple of turns with hands full of Forward Threes and Twos while I had a couple of mitt-fulls of nuthin but Turn Lefts!? It was a REALLY close race between me and The Girl – it came down to the very last turn and THIS register above (I think it was the third register of the turn) where she would have shot forward to claim the prize, but mine went first and bumped her off her path so I was able to turn and get to the final marker on the very last register!! 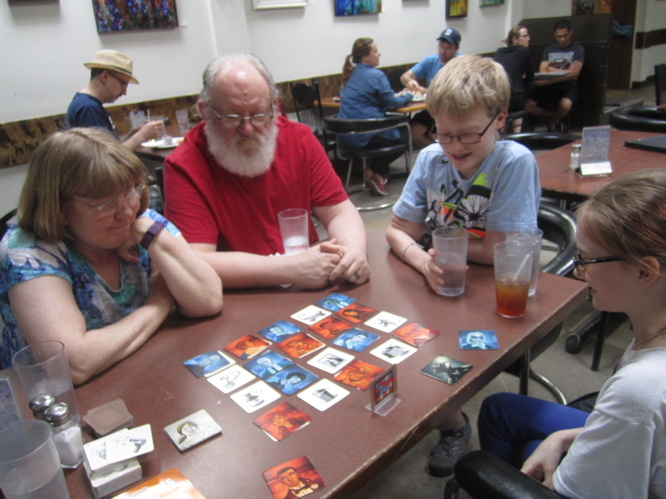 On Saturday Dragon’s Den Games was having another 20% off sale… apparently because it was Free Comic Book Day… but they didn’t have comics to give out… because they’re not a comic store… So they had a sale… Whatever, I went and bought a copy of Codenames: Pictures and Kingdomino. My mom had asked me to get a couple of games that we didn’t have, that we’d be interested in playing, that thaty could keep at their place and that THEY’d be able to play… not too tall of an order. 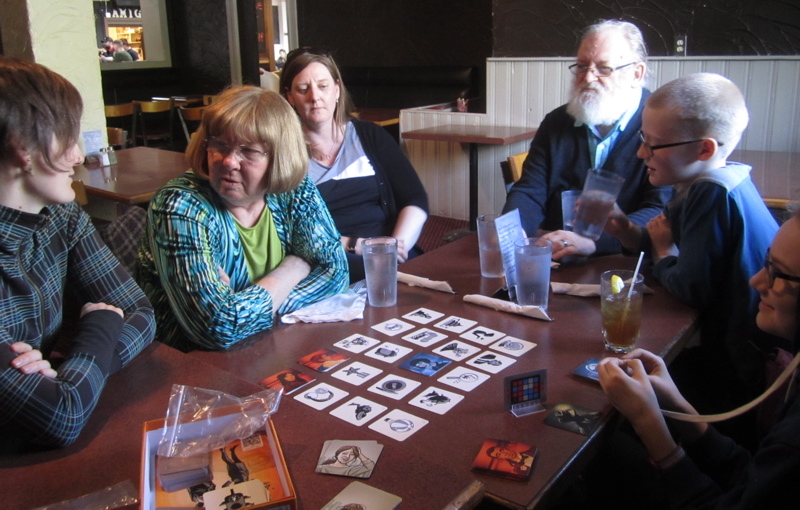 We happened to meet my folks for dinner at Amigos and we tried out Codenames: Pictures while we waited for out meals. 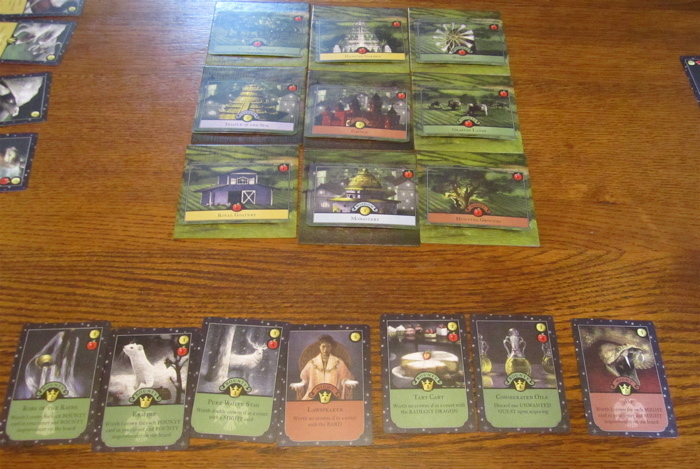 It’s okay… our game was a bit rushed… I ended up buying this one because I had a few promo tiles for it from International Tabletop Day. I’m beginning to feel like I like the Words one better (which I played a year and a half ago…). A well… this one is fine. Perhaps I need to give it a few more tries. Brent seemed to have it figured out and got this incredible juggernaut of European renaissance high finance rolling and I had no clue how to even create so much as a speed bump, let along STOP HIM!? I feel like I need to play this game every night for a week – like we did with Race for the Galaxy when we first tried to figure it out – then MAYBE I’ll start to get a clue how to play! 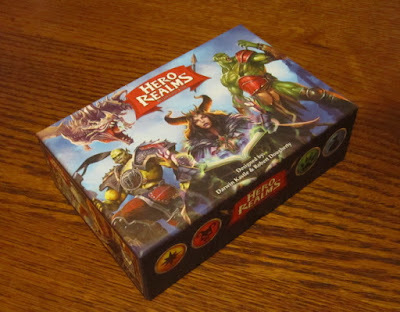 In the morning I had originally planned to go for a bike ride with the kids, but one thing lead to another and we didn’t end up going out… but we DID play another game of Hero Realms! This time The Girl played the Ranger, Finnegan played the Wizard, and I played the Fighter (which I’d picked up earlier in the week…). 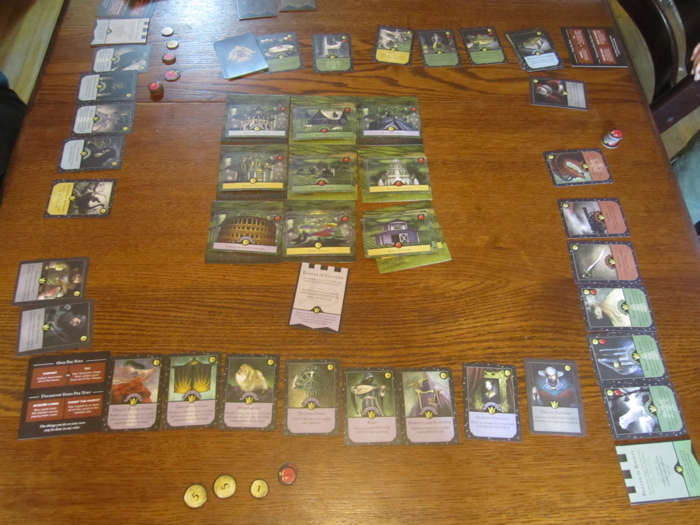 From this moment on I pretty much knew I would now forever be the first one to die in Hero Realms – in this ONE TURN (pictured above) I put out 15 points worth of guards, dealt about 30 damage and healed myself for 30… yeah… from that point on it was pretty much GANG UP ON DAD, HE’S TOO GOOD AT THIS GAME! Thursday the 11th was The Girl’s 11th birthday. 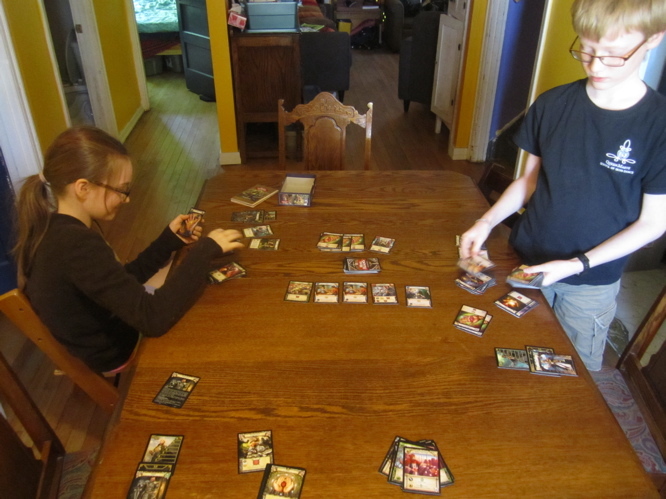 While waiting for supper we introduced Amanda to Hero Realms. I’m not sure we even finished the game…? After Supper we played a game of Super Dungeon Explore: The Forgotten King - as The Girl wanted to practice before running the game for some of her friends at her Birthday party the following evening. I played my Wandering Minstrel and Amanda played her Fallen Succubus (pictures of those from when we last played). Finnegan played the Deeproot Druid. We didn’t get through a complete game, but The Girl got the practice she needed. 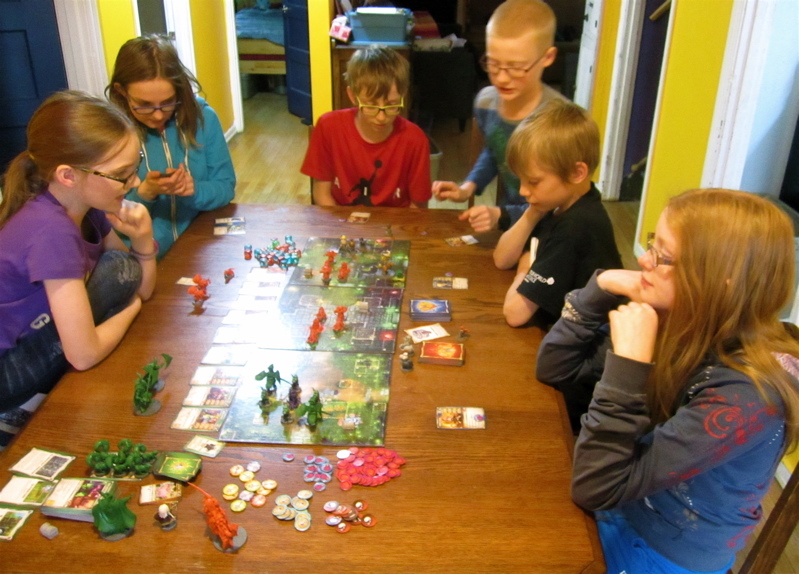 The following evening was her birthday party and the game went over really well. 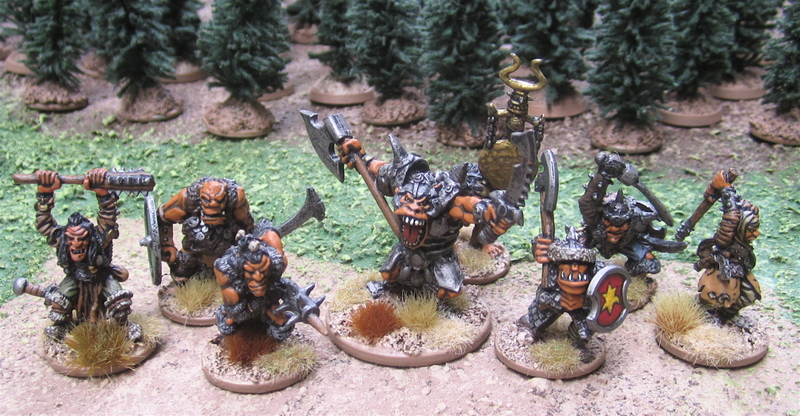 Over the two weeks preceding the party I painted up a bunch of Super Dungeon Explore Heroes and a few of the forgotten King’s Minions. 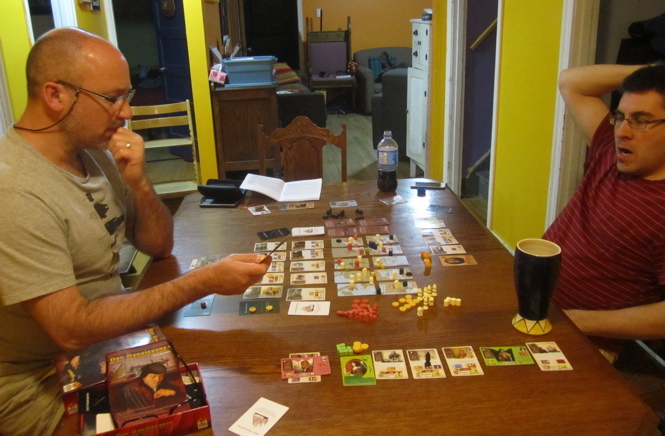 On Saturday the 13the I wandered over to Kurtis’ to play another game of Pax Renaissance with him and Brent again. This time I was a bit better rested. 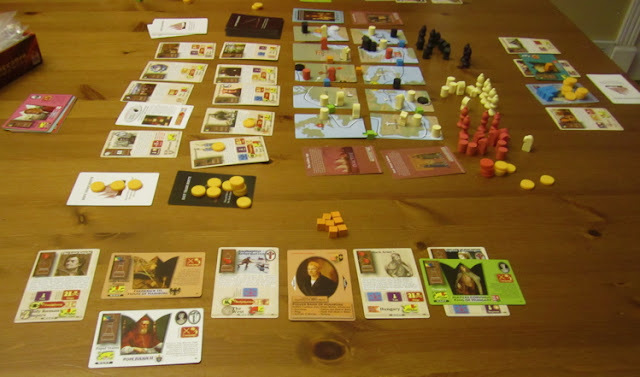 I played the Fugger bank of Austria and… I can’t remember who Brent and Kurtis played… I could look at these pictures and look it up... but I'm feeling too lazy to do that at the moment. On Sunday (the 14th) we met my sister and folks at Amigos Cantina for a supper with them to celebrate The Girl’s birthday. They brought along Codenames; Pictures again. 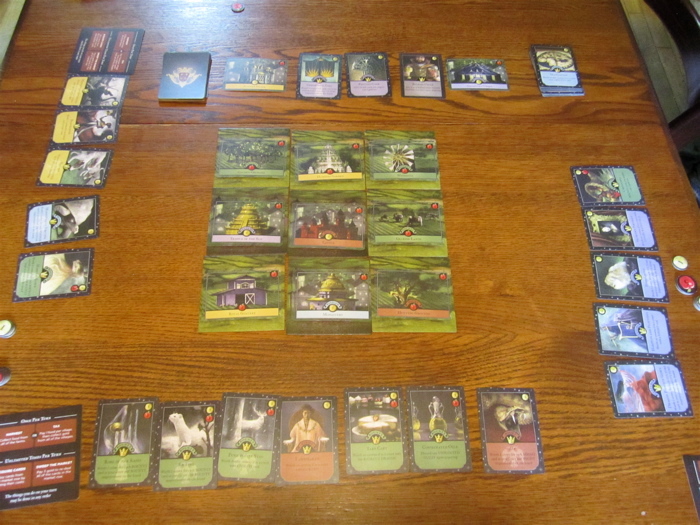 We played a couple quick games while waiting for food (boys vs. girls – with me and The Girl as Spymasters, we started a third with Amanda and me as spymasters, but the food arrived before we really got into it. On Tuesday we tried out Monarch. Ever since we watched the Tabletop Season Four episode about Monarch back an the beginning of February, The Girl has been super stoked about tracking one down. I’d actually added it to the list of games my Mother-in-law could look for to get for my birthday – but when Amanda told be she went and got ALL of the games on the list I suggested she could hold onto Monarch until May and give it to The Girl for her birthday. So she did. The Girl was SUPER EXCITED to get it!!! 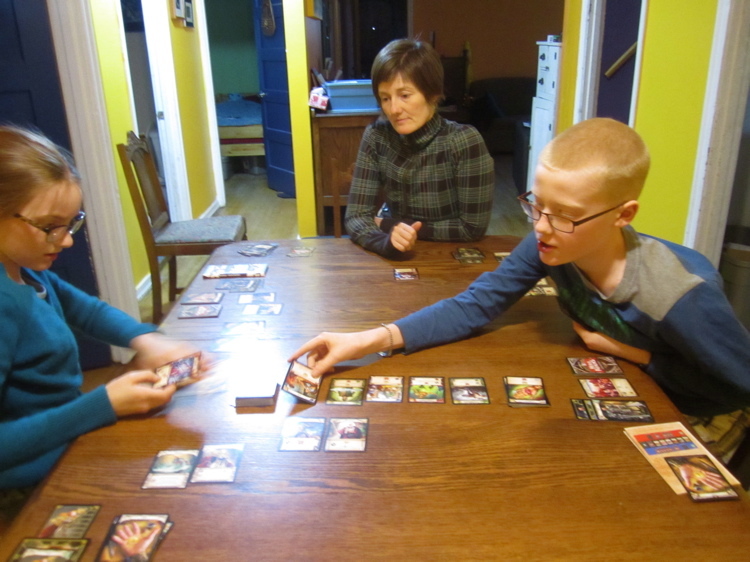 I crushed the kids going heavy on Bounty. 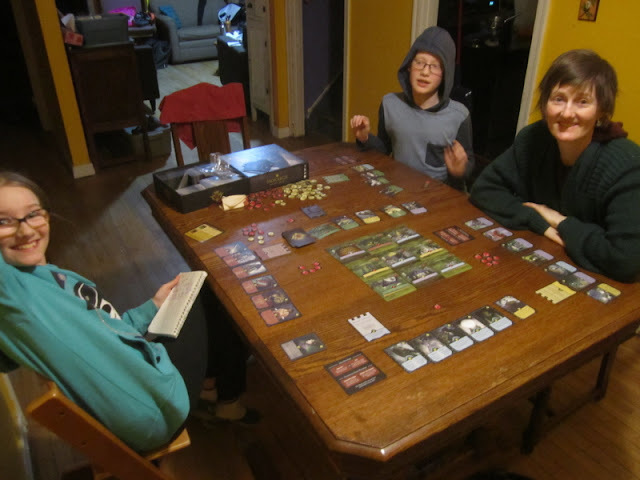 Later in the evening we introduced Amanda to the game. I didn’t make note of how that game went. I think The Girl won. 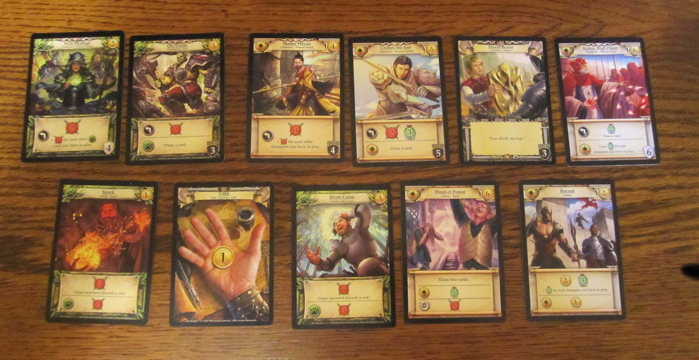 Friday Evening we played Legendary: The Marvel Deck-Building Game with the Deadpool expansion that Finnegan had bought some time ago and never got around to playing with. We played with mostly Deadpool hero cards… and some incompetant Agent of Hydra… and our mission was to stop Macho Gomez from stealing all the Chimichangas. It was weird. As I mentioned, the last week or so of May has been CrAzY busy with dance classes at the Uof S School of dance wrapping up and final rehearsals and recitals and getting a garden in and a bunch of other stuff going on. So we didn’t play any games as a family for over a week! Hopefully in June – and through the rest of the summer – we’ll find some more time for gaming. I did get in one last game at John’s on the evening of the 31st. 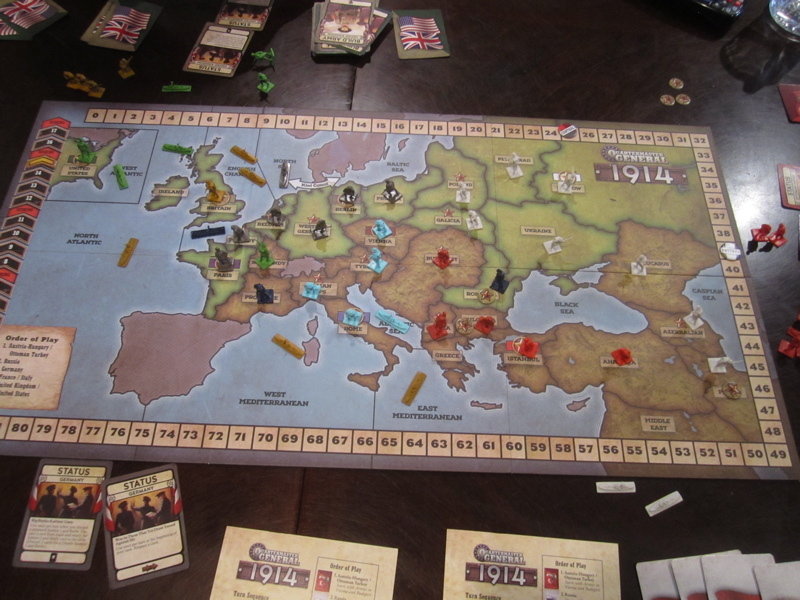 We played Quartermaster General 1914. 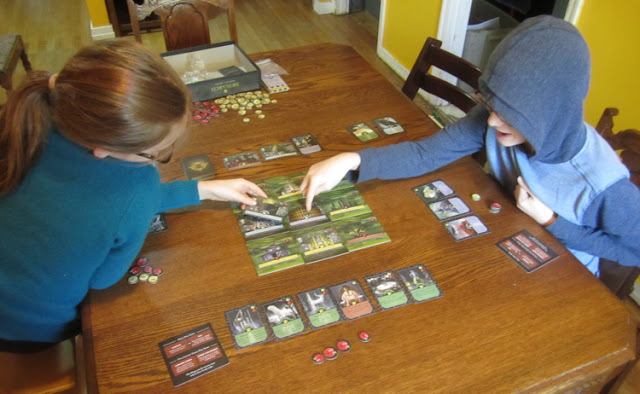 QMG 1914 is a lighter card-driven game of the Great War. 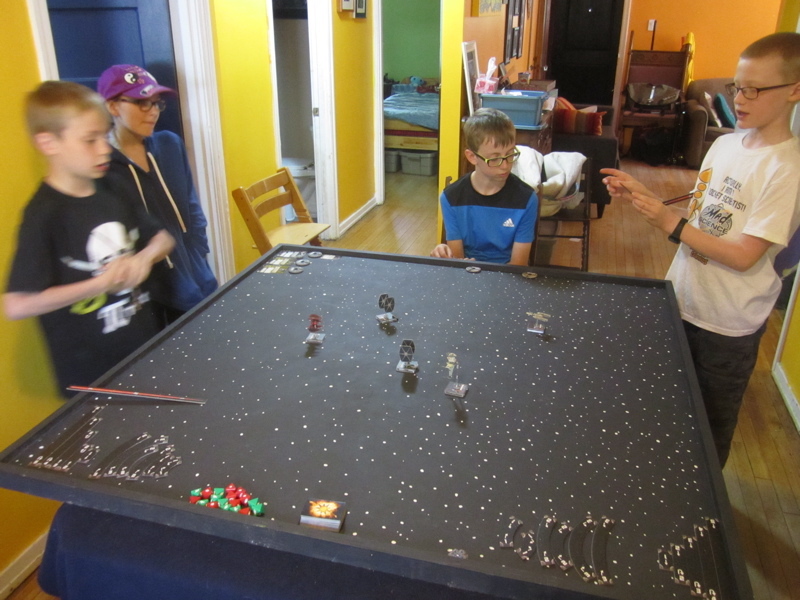 John actually called it “not a wargame, but an area control game with a war theme”. 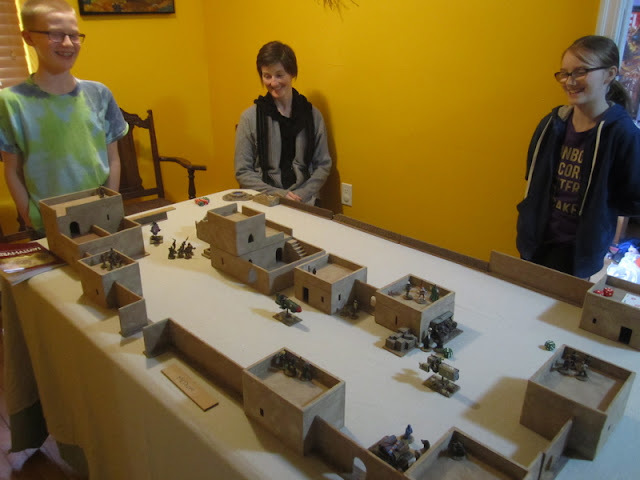 I liked it – I wish I’d had this to play with the kids instead of Axis & Allies 1914 back when we were boardgaming our way through history…. 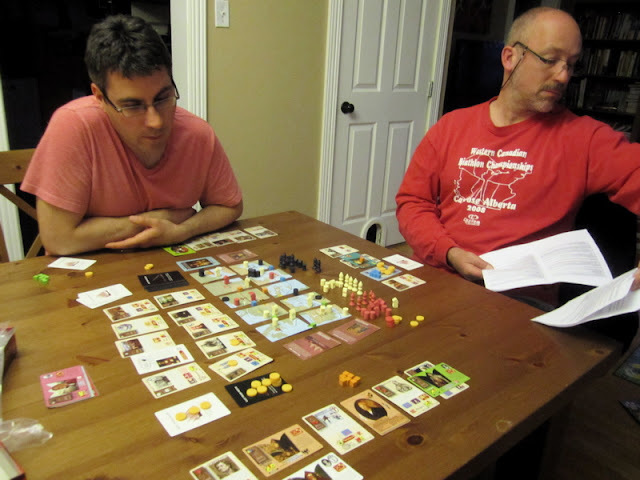 (I am reminded that I never actually FINISHED the last two posts about our boardgaming through history… maybe I should get on that…). I played Russia, John played the UK and the USA, Brent played France and Italy. 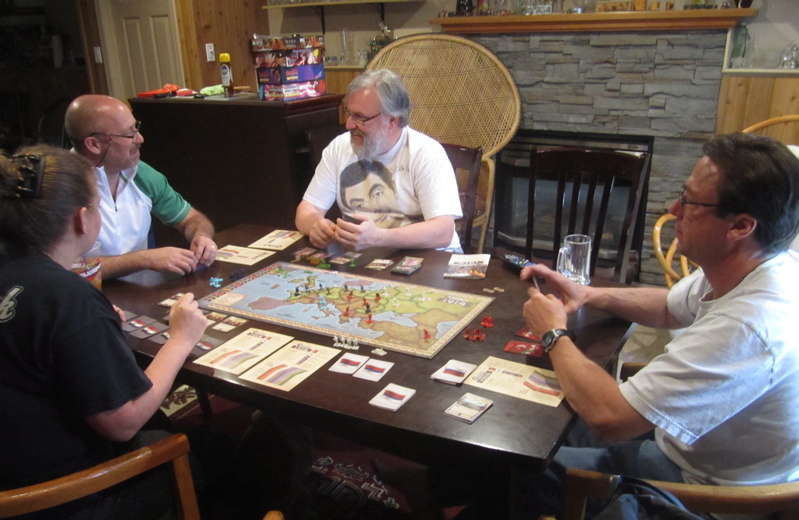 Opposing us were April, who played Germany, and Darrin playing Austro-Hungary and the Ottomans. It was a weird game – The United states was in the war quicker that the British!? In fact the British never landed an army in France – but the Americans did! Italy marched through Tyrol and marched on Vienna and captured it! This happened quite early in the war and kind of screwed Darrin for the rest of the war as he was unable to do much of anything (all his units being out of supply and unable to build new ones…). Near the end of the game – I used up all of my little men half way through the game and thus could expand no further – I could have used guys to attack into adjacent areas (on the rare occasion that I HAD land battle cards) but I wouldn’t have been able to take them over – just remove enemies from the areas denying them victory points – But the Germans had so many readied defence cards, I figured it would be pointless and tried to look for other ways to gain victory points (mostly through the use of event cards). I had a talk with John - who is the chief-organizer-guy for ToonCon - and I’m going to be running either Pax Renaissance or Pax Pamir on Sunday afternoon as part of their new “Learn to Play” series of games – Games that they figure very few people will have played - some of which may be “heavier” games (ones that can be a bit of a slog to try and read through the rules without having played something similar before) - that people can sign up with no previous knowledge and know that the person running it will basically walk them through a game (and hopefully not have one super experienced person show up and crush everyone else because they had no clue how to play). My Faustus Furius game (which I’ll be running on the Saturday evening) will be part of this series. There might be a COIN game in this series or High Frontier 3rd Edition - both of which I’d be excited to play as well. 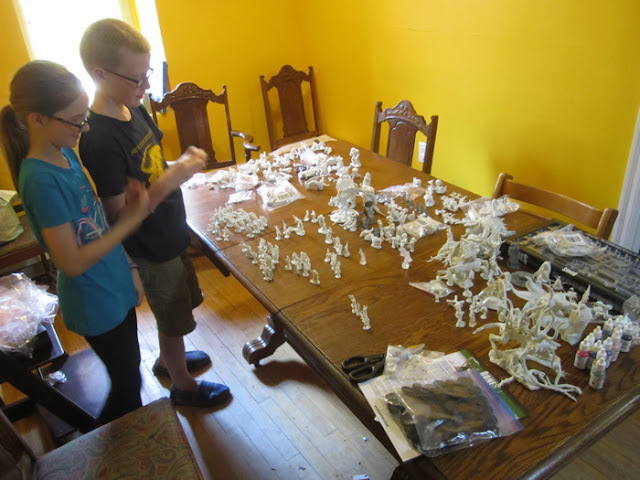 We have a few more weeks of furious activity – two or three more violin lessons, two more Irish dance classes (then two rehearsals and the final recital) and then our year-end homeschool reporting on the 20th. After that we are free and clear (mostly) for rthe rest of the summer… well… okay, we are renovating the kitchen – and I’m doing a lot of that… and the kids are each taking a week long theatre class at Persephone Theatre and Finnegan is going to Diabetes Camp and we’re all going on a short trip up to Prince Albert National Park for a few days of hiking and mountain biking… but OTHER THAN THAT – we don’t have much planned through the summer and I hope to get in a lot of biking and playing games! On two of the other Saturdays in June I’d like to get in games of Pax Renaissance or Pax Pamir - so I can let the ToonCon peoples know which one I’m going to run. I’ve been feeling the urge to run a role-playing game again. 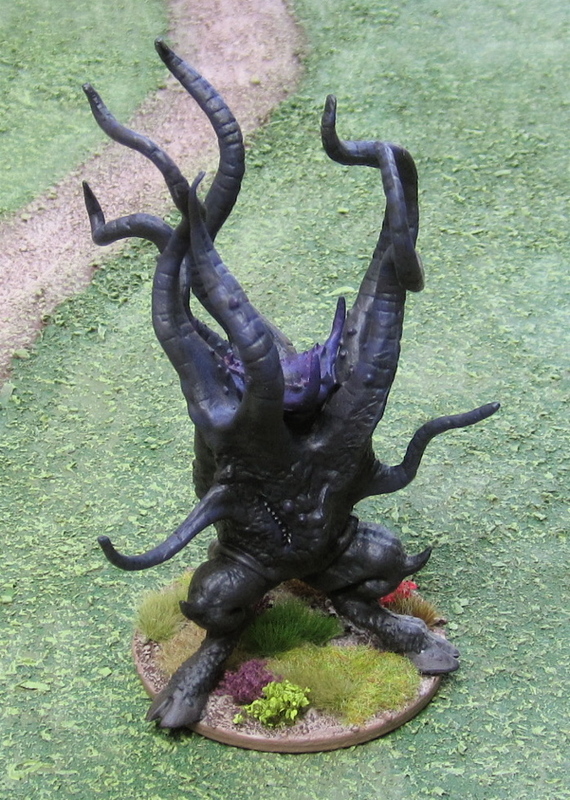 I’m pretty stoked about the idea of running a Cthulhu Invictus campaign. I’ve been considering running it with a very simple system based on A Song of Blades and Heroes or Fear and Faith (I’d been thinig if I’d run a more modern Cthulhu campaign I could have called it Fear and Faith and Fthagn!). I’d really like to run it for the kids – and maybe some others… I’m not entirely sure WHEN I’ll run it though… Ideally I’d like to get started over the summer – like, right after we’re doing with the Homeschool reporting! 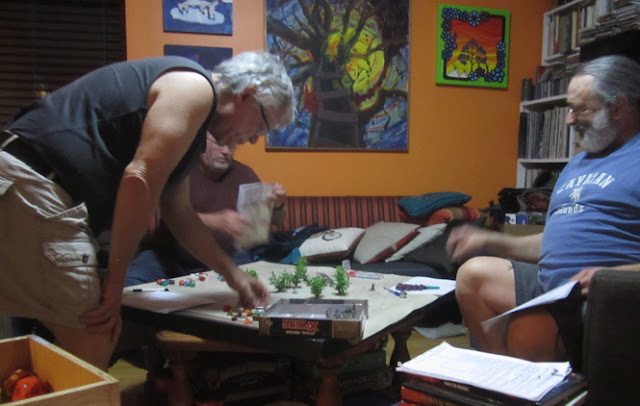 Bruce, who has been running the bi weekly Primeval Thule D&D 5E campaign, has said he’s hoping to wrap it up by the end of the summer and then he’d like to take a break and has asked if my or Bob (one of the other players) if we’d step up and run something. 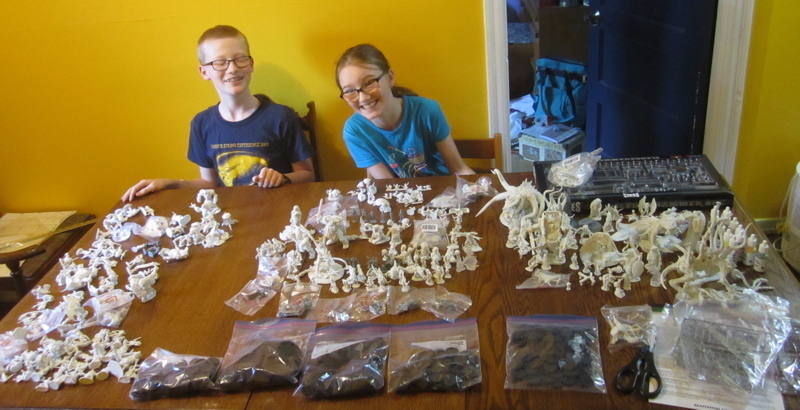 I could possibly run Cthulhu Invictus then (perhaps a separate second campaign – or rerun the games I’ve already run with the kids? )… or possibly I could run something else entirely. 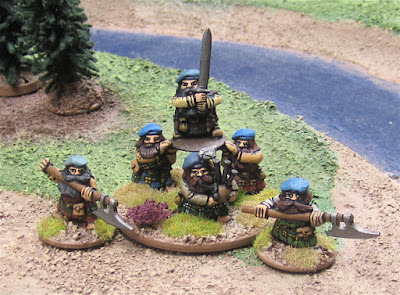 I did just back the Astropolis II Kickstarter - the Astropolis figures look PERFECT for a Rogue Trader…. Bah – I’ll worry about that after ToonCon. I need to get building some Jet Bikes! I've noticed that these Boardgame round-ups are my most popular posts - they are getting almost double traffic my regular posts of painted miniatures and miniature game reports!? Is it the labels? 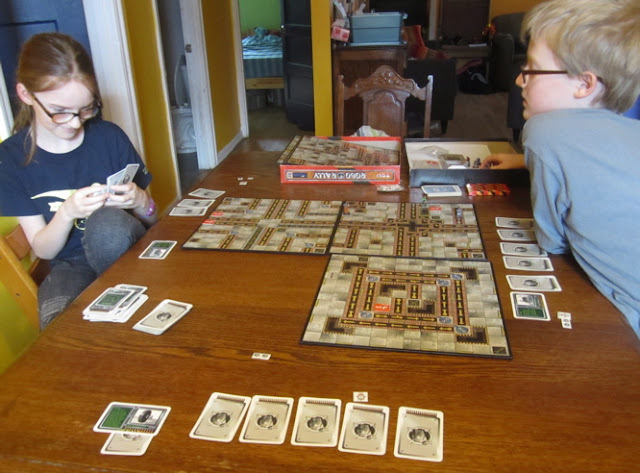 Searches for boardgames? If you're not a regular and you popped by to read this - leave a comment and let me know how you got here - I'm just curious. Probably some pictures of Dwarves I’ve painted for the Highland Dwarf Dragon Rampant warband – not to be confused with the Mountain Dwarf warband (yeah, I’m working on two totally separate dwarf warbands for Dragon Rampant). 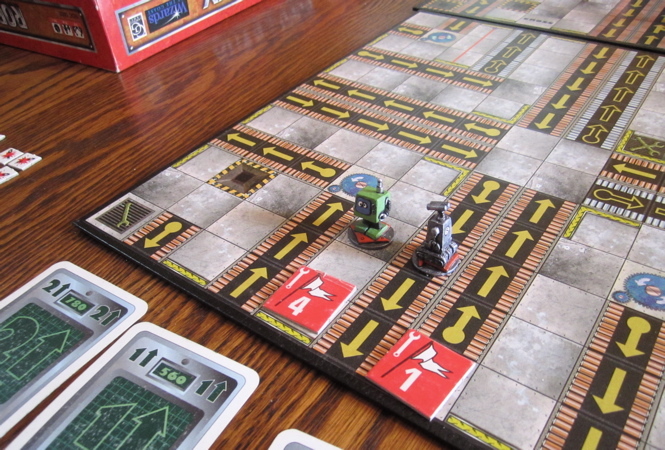 The hopefully a Giant Robot and the onto some Jet Bikes and more game reports! !